Truck driving Job without experience? When we give you industry wide established facts and statistics, you seem to think that your friend "Bubba" is a more reliable source. That is what is irritating about your responses. I'm seriously hoping you are smarter than that when you do decide to get into the owner operator business, because Bubba down the street, who once drove for Prime is not going to be able to help you at that point, but we will still be here, and still be able to give you some good solid advice. You never told me the established facts and statistics, you just said its not good to be O/O this years, the reason you told me its not a fact cause i ve been to dispatcher office and saw how is he doing everything hundreds loads to choose every day, to every state and with fair pay. I can see by your posts you are little bit angry i didnt mean that but i will never know if i dont try it right so lets wait and see? I'll get back to you in half year and let you know my experience. Btw my friend Bubba who drove for prime 4 years ago is now driving for small local company with around 15 trucks and he is putting his third truck(he is driving one, his brother, and the new one idk) on the road next month with 50% down on 70K, bought a 200k house also with 50%. So you can stay in the company truck and be happy with your life and say that being driver for someone else is better. As I said before you cant never do better if you just think that the truck will be broken down every week. Btw about where is the money for repair coming this time im not that stupid to buy truck with my last money i will always leave 20-30k on side for any case. I can see you are Realist so you will continue driving for someone else and you ll be happy thats who you are. I will be happy for a while and then i will try it. Im writing here all day and nobody told me why is O/O so bad(i read some other questions on the forum about that though) Because of spending more time on paperwork? Because of spending more time on taking care for the truck? Because the bigger companies can take the loads for less money? Ive spent few days in my friends(dispatcher) office and see how everything goes. Most of the loads he gets are for 2$ per mile sometimes the load is good and he gets even 3$. They are breaking even with around 1.30 to 1.50 so there are still 0.50 left for them(plus the 12% they are taking from every truck). So im driving my own truck for 2$ per mile im paying myself 0.5 plus the 0.5 left im looking at 1$ per mile. Driving with partner 5000 miles per week seems really good to me. I just cant see the problems, Im not being smart just tell me what am i doing wrong or where am i miscalculating and dont say bigger company will eat you because there are so many dispatcer companies and loads you can choose. It is an absolute joke that you think drivers in here are working for .04 cents a mile - you have got to be on some other planet or just willfully ignorant. Just to let you know they are paying 0.5 for all drivers so there is now way i will start driving under 0.4 like a lot of people here. Just to let you know they are paying 0.50 for all drivers so there is now way i will start driving under 0.40 like a lot of people here. I was talking 0.30/0.33 with him earlier today. Koban, you said in one place your friend's company requires 1 year experience and they pay "0.5 for all drivers". There's a contradiction here. You haven't even got a license yet and are set on that 50¢, but you can't work there without one year's experience. How will you make 50¢/mile before your first year is up? Kopan, I'm not sure why you are even in here - You already know way more than any of the experienced drivers who so freely give of their time on this forum. We can't help you, we've tried repeatedly - you are so much smarter than any of us, that I wish you would start your own forum so that we could come in there and learn from you. I wish we could help you, but every once in a while the folks who come in here render us completely useless, and you my friend have done an excellent job at that. Kopan, all I can say my friend is that your guesses and assumptions are pretty much coming out of left field or the clear blue sky, I'm not sure which. Maybe there's a clear blue sky in left field. I don't know. But I do know they're based on absolutely no real knowledge or experience with the subject matter and would fall under the category of wishful thinking or would be considered wildly presumptuous at best. I'm not trying to insult you. I'm just saying you're making things up in your head and then choosing to believe them because they seem plausible. For your own sake you really don't want to do that. To say the profits in a business "should be really good" when you're totally guessing, or to say you won't work for a big company because "they are big companies and they don't really care" as if that's a proven fact is no way to make decisions about your employer or a business you're thinking of starting. Do your research and use proven facts whenever possible to make decisions. Don't go buying trucks or applying at small companies because you think things might be a certain way. Dig deeper. Test your theories. Learn from the experience of others. My assumptions are not coming out of the blue. Its true i dont have personal experience in driving truck but I have at least 10 really close friends driving trucks, few of them have their own. I have a friend right here in Florida who is working dispatcher for his brothers company. Tell me whats so wrong about my assumptions? I cant start driving for my friends company in Florida because their company insurance would be a lot bigger with drivers without experience and they are 1 year open now so they cant afford that. Just to let you know they are paying 0.5 for all drivers so there is now way i will start driving under 0.4 like a lot of people here. Ive seen their reports, im talking to them every day, its not everything milk and honey but you cant change my opinion that being O/O its better then being just driver. You are driving your own truck, you will care about it more than your company truck and how come when you drive company truck most of the time everything its fine with it and now sudenly if you have your own it will be for repair every week? Every business has ups and downs but i just dont see the problems that big as you are showing them to me. About the big companies, I know that for sure because a friend who was driving for Prime quit because sometimes he'll be stuck somewhere and needs dispather help they will leave him waiting there with hours and hours and whenever im with my friend( the dispatcher) he always anwser his phones to the drivers because its his company and he cares about the trucks and driver problem its his problem which is not the case in the big company where dispatchers are just employees. Have you added up all the costs of owning a truck? Most O/O either go under or just break even with company drivers with more work required to run the business. Do you know how to find a good truck to purchase? People in this forum are against O/O because they are experienced enough to know what they'd be getting into. So, what will make you different from the experienced drivers? Please note I'm not trying to sound rude, I'm actually curious. As far as that pay, Prime pays a decent starting CPM to rookies if they'll take you. They pay more for driving a lightweight truck and have some decent bonuses for fuel plus per diem pay. But, I agree with Brett. I wouldn't leave a job paying $700+ a week hoping to make more in trucking because it's just not going to happen consistently. Of course i consider most of the things. Fuel, insurance, maintanence, inspection, the monthly payments for the truck, but still after all those things you can make a lot of money. Im pretty sure i can get 0.48 per mile when i start driving in Chicago, and when i buy my truck it will be plus the money for my loads from the company, it should be really good. I know sometimes there will be problems with the truck and its a big cost but you can never start a business if you think just about the bad things that can happen to it. Yes 700-800 its not that bad for work in restaurant, there are some good sides too, but you cant go up,,(im just not one of those people who only work at one place and stay as a regular employee for years and years) here you can always do better, one truck, two trucks, you can open company, while to open a restaurant you need a lot more staff to do and a lot more money. Btw i think i will never drive for a big company like Prime, Swift or similar not cause they are bad companies but cause they are big companies and they dont really care, if you want to drive for 0.30 drive if not you can leave. I would not recommend leaving a job that pays $700-$800 per week for trucking just for the money. You can certainly make a little more than that, but trucking is a whole different world. It's really more of a lifestyle for most people than a job. Go through our Truck Driver's Career Guide from beginning to end and follow all of the links you come across. That will teach you what this career is like and what it takes to get your career off to a great start. The paychecks in trucking are also not "constant". You'll have a huge week followed by a lousy week because you spent two days in the shop. Then you'll have two more great weeks and a lousy week because you took three days off. You can expect to make maybe $35,000-$40,000 your first year now that wages have come up a tick or two in recent months but the paychecks will fluctuate wildly along the way. Just be aware of that. Thank you for your time guys, i found a lot of companies, but my point was there arent a lot in Florida, and the few i found they have really low pay like 0.3, 0.33 per mile. ... i wanted a job with a bigger and constant cash flow, at least like 1200, if i wanted 700-800 i would stay in a restaurant. Suppose you average 2000 miles a week, which is a reasonable starting place. That's 2000 x 0.33 = $660 per week (gross). I've been with Swift for about 6 months. I'm making 0.36 CPM now. That makes our 2K mile example worth $720 gross. If you're dreaming of $1, 200 weekly as a company driver, that's an impossible 3,636 miles in a week. Even at 0.40 per mile, to get that $1,200 you need 3000 miles. A large majority of drivers start on the "ground floor". Thank you for your time guys, i found a lot of companies, but my point was there arent a lot in Florida, and the few i found they have really low pay like 0.3, 0.33 per mile. The main 2 reasons because i chose this its because there arent a lot of people on your head telling you how to do your job and i wanted a job with a bigger and constant cash flow, at least like 1200, if i wanted 700-800 i would stay in a restaurant. Sorry, im not being arogant, just impatient, but time is flying and i need money after that so i have to start asap. 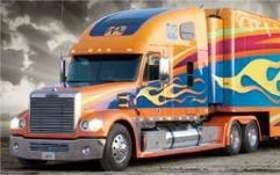 Is here anyone who got his cdl in Massachusetts? And which sponsor company will you recommend to me? Ok sir thanks for the response. One economic concept you need to know; Every company in the entire world is using their employees to make money! When you are learning, the company is losing money by having you on their payroll. The have to pay for equipment, maintenance, insurance, etc. The company is also losing income because your trainer, who should be an experienced driver, will not be able to complete as many loads/miles when he is training you. When you go solo and start hauling your first loads, you will not be as productive as an experienced driver. As you become more efficient and can better manage the driving and work requirements your pay will increase. I am now in my 8th month driving solo. I went through a company CDL training program and made $400/week while with my trainer. I then started out with making $0.28/ mile and had one of the oldest, highest mileage trucks in the fleet. I am now up to $0.40/mile and was handed the keys to a 2014 with 5,000 miles. There are basically two ways to get your CDL. First, if you have the funds available, you can pay for it up front, or with a loan, and go to a private school. Unless you go to school and have other employment, there iis no income until you start work. Or, you can attend a company program, be paid a small amount while you are in training, then go to work for that company. There is no right or wrong way to get your CDL. It just depends on which path best fits your situation. Either way, at the end of one year, you will be sitting at just about the same position whichever path you choose. Hi im 21 and I want to start driving truck. I wanted to start with company that will pay for my training but than one guy changed my mind saying they are jusy using me to make money. What shoud I do?Do you think it will be better if I pay my training?